Should you get an Irish Red White Setter? Find out in this guide here. The Irish Red White Setter nearly became extinct. Luckily, his exceptional abilities are well-known, and hunters fought to keep the breed alive. He is distinguished by a red and white coat. The Irish Red White Setter is just as friendly and affectionate as the Irish Setter but also has the same potential for stubbornness. He comes in a more standard size, typically weighing 60 to 70 pounds. The Irish Red White Setter enjoys long walks and hikes at a moderate pace. He also loves to run. Given an ample daily quota of exercise, he is a calm and fun-loving companion. He can be a great dog for families with older kids, but he’s probably too energetic be set loose with babies and toddlers. He does not have problems living in a home with other pets, including cats, especially if he’s been raised with them. Irish Red White Setters are alert and will loudly announce that someone is approaching. Choose an Irish Red White Setter if you are an active person who can give him the exercise he needs. He’s also an excellent competitor in dog sports like rally, obedience, and agility. He can also be an excellent therapy dog. But be warned! If you don’t give him an outlet for his energy, he will become frustrated. A people-loving dog like the Irish Red White Setter needs to live inside the house with his humans. The Irish Red White Setters like to be around people. What Price are Irish Red White Setter Puppies? The price of Irish Red White Setter puppies is approximately $1,200 to $1,500. How to Find Reputable Irish Red White Setter Breeders? Be perceptive, observant, and discerning. Visits or meetings with your prospective breeders should be all about transparency. You want to be sure that you find a breeder that produces healthy, well-socialized puppies with good bloodlines and temperaments. Make a call to the breeder to see if they have puppies available, then arrange for a visit. First impressions are important. The breeder should be welcoming and relaxed. Their home or facility should be clean, odor-free, well-ventilated, and secure. While interviewing possible breeders, the conversation should go both ways. Your breeder should be just as interested in the wellbeing of the dog as you are. If they don’t ask questions about you and appear to be uninterested in how the puppy will live, you may want to skip this breeder and search for a new one. A responsible breeder is committed to putting their puppies in the very best and most loving homes. Don’t be afraid to ask the breeder for references. Get in touch with others who have purchased a dog from this breeder and ask about their experience. The earliest written records that refer to this breed date back to the middle of the 17th century, but paintings from a century ago show similar breeds. They were favorites with hunters because they were easy to see in the field. But when dog shows became popular, it affected the popularity of red and white dogs. More people desired dogs of solid red color. They were saved through the efforts of a parson from County Down, Rev. Noble Huston. 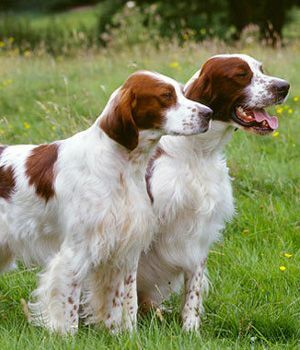 The Irish Red and White Setter has to be red and white in color. His base color is white with solid red patches. Flecking is permitted around the face and on the feet. It can also be up the forelegs, elbow, hind legs, and hock. Flecking, mottling, or roaning on the Irish Red White Setter’s body is not desirable. Long, silky hair can be found on the outer ear flap, on the back of the hind legs and forelegs, as well as on the throat and chest. The feathering cannot be curly or wavy. It also cannot too dense or look puffy. The Irish Red White Setter has a silky coat that moderately sheds. His hair easily repels dirt and does not need many baths. He will need a bath only when he gets smelly or really dirty. He will need to be brushed and combed out a few times a week when he is not working in the field. If he is used in the field, then he will need brushing every time he comes in. Mats and tangles in the coat need to be handled right away, especially in the ears and the feathering. By brushing him on a regular basis, his coat will stay clean, glossy, and easy to care for. 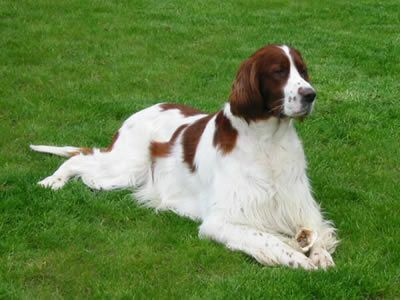 The Irish Red White Setter will need his nails trimmed every two to three weeks, depending on how fast his nails grow. His ears should be checked and cleaned. Remove any sign of wax, oils, or dampness to prevent ear infections. It’s always a good idea to brush his teeth often with a veterinarian-approved toothpaste. How Big is a Full-Grown Irish Red White Setter? The Irish Red White Setter can grow up to 22 to 26 inches and weigh 50 to 75 lbs. What is the Life Expectancy of the Irish Red White Setter? The life expectancy of the Irish Red White Setter is 11 to 15 years. The Irish Red White Setter is not a good watchdog. The good-natured and affectionate Irish Red White Setter is not only a popular hunting dog. Thanks to his excellent scenting ability and strong natural instincts for pointing and retrieving, he does double-duty as a family friend. He likes kids and can fit well into a family with children, with the caveat that he is quite rambunctious, especially as a puppy. He should always be supervised around toddlers. The Irish Red White Setter is alert, so he’s a good watchdog. But he doesn’t have the protective nature of a guard dog. Gentle, friendly, and mild-mannered once he’s past puppyhood, he also has the makings of a fine therapy dog for visiting facilities such as nursing homes and children’s hospitals. In the field, the Irish Red White Setter works at a moderate pace, never too far away from the hunter. He’s full of curiosity and searches the ground thoroughly for game. Choose him if your happy hunting grounds are wooded or near a river or lake. When it comes to training, the Irish Red White Setter can be a contradiction in terms. He’s gentle but headstrong. He’s smart but slow to mature. Train him with a light touch so as not to warp his determination, courage, and high spirit. There is no one particular diet that is best for your Irish Red White Setter. You should always feed your dog the best quality food you can, preferably one with quality ingredients and fewer byproducts. Complete dog foods will have all the vitamins and minerals needed for both puppies and adults. How Much Exercise Does an Irish Red White Setter Need? This is an active sporting dog who needs daily exercise. Take him for a run, go on a long hike, or walk him for half an hour twice a day. Get out there and play fetch until your arms begin to ache. All these activities will help satisfy his need to be outdoors doing something. If you’re interested in dog sports, he’s an excellent candidate for agility, flyball, obedience, rally, and tracking. In addition, he will also enjoy running free in the safety of a fenced yard. The Irish Red White Setter is distinguished by a red and white coat. The Irish Red White Setter is prone to von Willebrand’s disease and Posterior Polar Cataract, a minor form of cataract that does not lead to blindness. The breed is also known to suffer from Canine Leucocyte Adhesion Deficiency, an autoimmune disease. The Irish Red White Setter is an even-tempered and friendly dog, making him a wonderful family dog for active families that spend a great deal of time outdoors. He does not make a good watchdog because he’s too friendly and eager to please people. 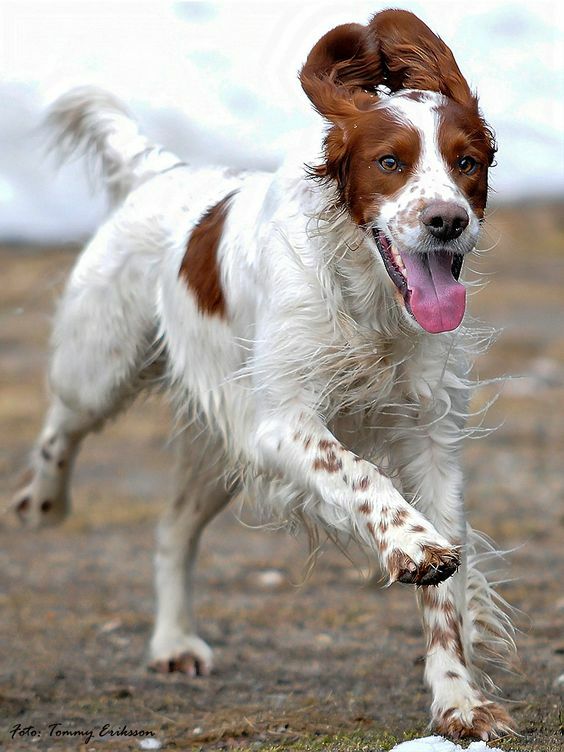 The Irish Red White Setter is a working dog and enjoys the thrill of the hunt. Since he is an excellent tracker, a game of hide and seek will keep him entertained and give him that much-needed exercise. Because he is easy to train, the Irish Red White Setter makes a great competition and field competition dog. This dog likes to be around people. But if you are away from home most of the day, this breed will be fine if he has other dogs to keep him company. Because he needs a fair bit of exercise, the Irish Red White Setter will not like spending too much time in kennels or confined spaces.